How To Use Forms Effectively? Using forms on your website can provide insight into your clients, increase conversion rates and grow leads. However, how you set up your form can either positively or negatively affect the user experience on your website, leading to a drop in conversion rates and leads. Taking some simple but necessary steps to mitigate issues will help you to create an effective form. There are some general guidelines when creating fields for your forms. Typically, people tend to not fill out more than two to three fields. Therefore, it’s important to determine which information is necessary. As well, it’s important that the length of each field is appropriate for the requested information. For example, you should leave the number of character spaces needed for a postal code in your region. There are many strategies you can use to make your forms more user-friendly. For example, many users tab between fields. Ensuring you account for this will greatly benefit the user experience so that the progression from field to field is coherent. As well, a form that automatically updates itself based on input from a user is also beneficial. If the first few digits of a credit card number would indicate their credit card company, have your forum auto-select that card so the user doesn’t have to. Additionally, your call-to-action button should be clear and easy to find. Typically, it’s effective to also highlight subtly which sections are required and which are optional, assuming there is a mix of both, and make sure the intention of the form is clear. Grouping together related information can make filling out the form much easier for the user, and submit options should be clearly visible. There are many ways you can make your form stand out to users. You can direct the user’s attention to your form using images or designs, such as arrows. As well, you can use bold colours to make your form stand out against the rest of your site, however they should be complementary to your website’s design as to not interfere with your branded look. It’s recommended to run tests on various forms to see which results in the highest conversion rates. Running A/B tests on your current and revised forms can help you to determine which is best. Data tracking and analysis can help you to determine the effectiveness of your forms. 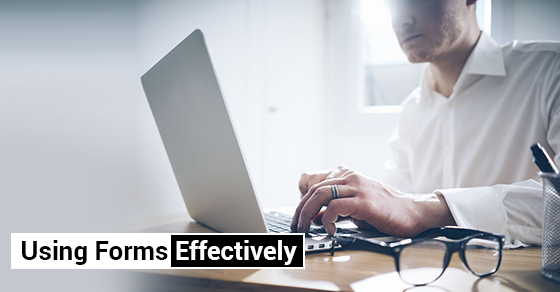 Keeping these tips in mind will help you to create a user-friendly, creative and effective form that increases conversion rates.